Last post I'd explained about how I stitched the sunflower petals with free Trellis stitch. Since there were no photos alongwith the explanation, I believe it was difficult to understand. Here's a quick step by step on how to fill the petals. 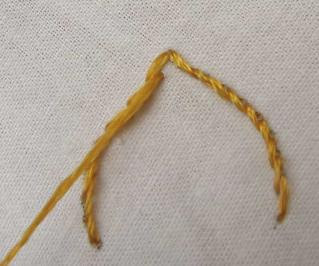 Step 1: Outline one side of the petal with stem stitch from bottom to the tip. 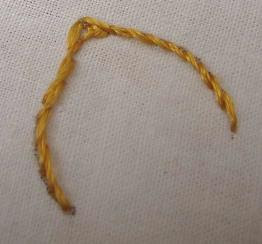 Step 2 : Make a small foundation stitch on the other side. Step 3: Come up at the tip again. 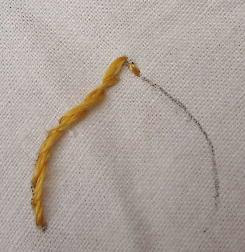 Step 4 : Stem stitch the remaining portion. Step 4 : Come up at the top ,at the position shown in the picture below. 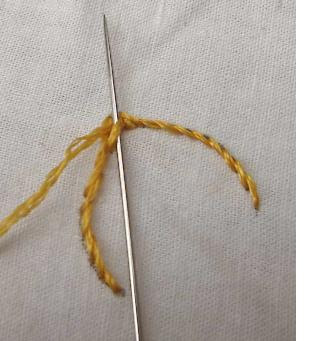 Step 5 : Insert the needle carefully into the foundation stitch as shown below. 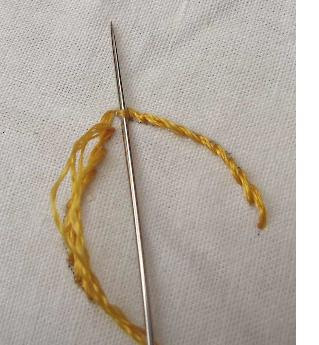 Step 6 : Wrap the thread around the needle over and under. 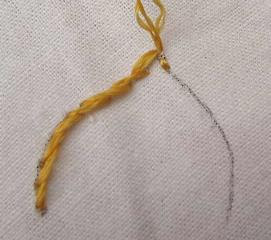 Pull the thread through to form the knot. Step 7: Go down to complete the first row. Step 8 : Come up again on the left side,slightly below the first row. 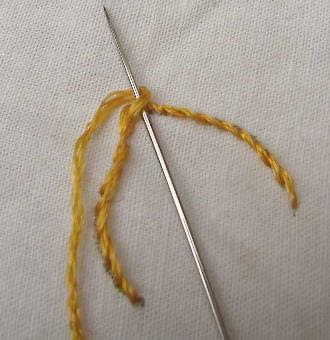 Insert the needle into the bar formed by the previous knot. Repeat this process throughout. As the width of the petal increases,the number of stitches will also increase. For the completed petals and flower, see this post. Hopefully the method is now clear to all of you.In case of any doubts,please feel free to ask . My classes have ended and Iam enjoying my free time :) That's why the increase in the frequency of posts. If everything works out fine, I'll be soon back with the final blocks on the bedlinen. Deepa, it's perfect! When I'll give it a try I'll let you know - it's so beautiful! Thanks again. 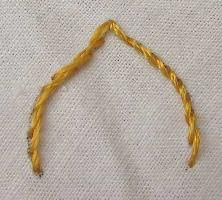 Lovely description of the Trellis stitch. Seeing your bed linen makes me want to start on one that I have planned and is still in planning stages since long! I'm eagerly waiting to see the completed linen. So far all your blocks are beautiful, but I personally think this trellis stich block is exceptionally beautiful! Will you be using the linen as a quilt(assuming its not used for sleeping, but just to cover the bed) or a linen where its used like a bed sheet? Beautiful sunflowers! the flower at the left looks so goooooooo...d. better illustrate one more row. Hi Deepa, this work is lovely, I will have to take some time to really studay it. 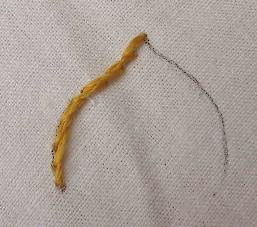 The Caron threads are a type of thick thread of 3 strands. Actually the Brand is Watercolours and it is a 3 ply pima cotton. It is handpainted (read dyed).. and these are from the Carol collection. They are made in the USA so if you googled this you might find a supplier. I know of a supplier in Brisbane who could have them. I could find the email address for you.